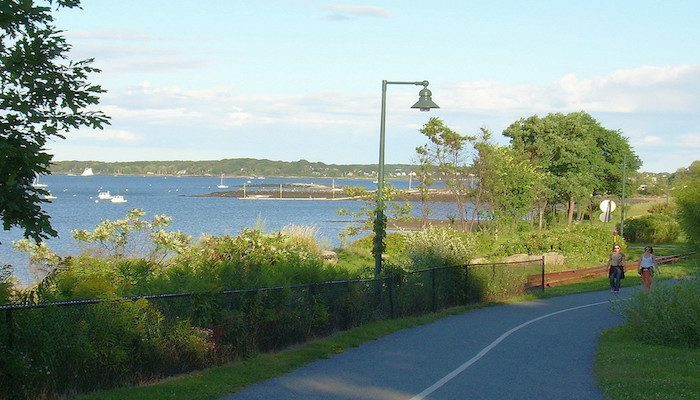 The Eastern Promenade Trail is one of Portland’s centerpieces, running from downtown, along the water, to Back Cove. The waterfront trail is built along an old rail corridor and offers spectacular harbor and ocean views. Highlights include ocean views, Fort Allen Park, East End Beach, and the Casco Bay Community Garden. The route starts at the Commercial & India St. Bus Stop (easy access for commuters or travelers without cars). At the end of Eastern Promenade Trail you’ll take a right to connect onto Bayside Trail, which will loop you onto Back Cove Trail for a short stint. You’ll then connect back onto the Eastern Promenade Trail to loop back to the start. This route is mostly flat but has a small rise near the Portland Water District treatment plant, and another near Tukey’s Bridge, before it connects to the Back Cove Trail. It can be a tad confusing when merging with the Bayside Trail around the tangle of highways. This is an out and back, or can be combined with a larger loop involving sections of the Bayside and Back Cove trails. For more runs in this area, visit our Guide to Portland.